What is the Diocesan Pastoral Council? Welcome to “Liturgy Notes”, the liturgy and music section of the Faith & Life e-newsletter. This month contains details of the upcoming music workshops, a review of the Easter seasonal psalms, as well as our regular section on recommended music selections for upcoming Sunday Masses. In lots of ways youth ministry is something that I have stumbled into. During my degree in Economics at Sydney University I became increasingly involved in campus ministry, and after finishing the degree (during formation as a student for the priesthood) I worked in campus ministry at a number of universities in Sydney for a few years. However, I never really imagined that my priesthood would be particularly marked by youth ministry. I loved my time in campus ministry and hoped for a chance to do more work with post-school young people, but wasn’t sure how that would be realised. A few months after ordination in 2006, I was on holidays in Queensland when a friend I was visiting invited me to the Ignite youth conference the following week. That was definitely a turning point. Celebrating the sacrament of reconciliation during the days of the Ignite conference transformed me. I found so many young people who were hungering for God, and in the environment of faith that Ignite provided, they were being challenged to truly live for Jesus. The ministry of reconciliation allowed them the freedom to say goodbye to any rubbish in their old lives as they committed to a new life with God. Since then I have had many opportunities to work with the equally incredible young people who are part of our local diocesan church – in schools and school retreats, parish youth groups, summer school, Youth Mission Team and iStand and on campus at Wollongong University – as well as having the chance to be part of initial training each January for young people who have committed a year of their lives to serve with National Evangelisation Teams. Now as chaplain to CYM, Bishop Peter gives me an opportunity to share my love for Jesus Christ with the many young disciples who are scattered across the Diocese, helping the CYM team to continue to develop youth ministry according to the Australian vision for Catholic Youth Ministry, Anointed and Sent. Bring it on! P.S. Don't forget you can still register for our Youth Ministry Essentials Training Program with part one beginning on 21-22 April in Wollongong. Download the flyer here. 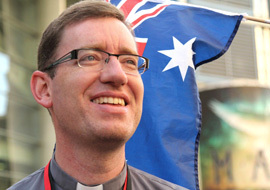 Fr Richard Healey was recently appointed by Bishop Peter as the chaplain to Catholic Youth Ministry (CYM) Wollongong and was officially commissioned at the World Youth Day Mass held on 25 March 2012 at St Francis Xavier Cathedral. It is with great pleasure that we publish our Diocesan Calendar for 2012. This calendar contains major diocesan events, training & formation opportunities, and significant liturgical feasts & celebrations occurring in the Diocese during 2012. We hope you will find it a useful way of becoming aware of and involved in the diverse range of formation and celebration events occurring within our Diocese this year. The calendar arose out of the in-service day held for Parish Pastoral Councils in early February and was originally written specifically for clergy and Pastoral Councils as a way of alerting them to the formation opportunities available within the Diocese. It has since been expanded to include a variety of material relevant to all people within the Diocese. This calendar is a beginning and as such we are happy to include other events as they come to light. Please contact us with details of any events you would like advertised and we will endeavour to publicise them in upcoming issues of Faith & Life. Download the 2012 Diocesan Calendar as at 1 April 2012. Soccer season has just begun, and after a sometimes messy time of registrations, teams are graded and the season commences. People join for all sorts of reasons: to get fit, to socialise, to improve their skills.The Easter season is also soon to begin. It can be a somewhat confusing time. Whereas soccer is pretty straight forward, what is going on when we celebrate Jesus’ birth at Christmas only to see him die four months later? Stranger still, this is the time of the year when adults seeking to join the Catholic Church are baptised. What has Easter got to do with Baptism…and soccer? Perhaps some of the reasons people are Catholic may be similar to why people play soccer. People may want to get spiritually “fit”, to socialise with other Christians, to improve their skills in their moral life. Yet Baptism is not really about joining up to some club for self-improvement or to better ourselves. Baptism is about God calling us and inviting us to become a member of God’s team – the Body of Christ. 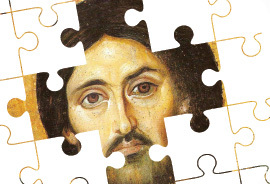 The reason we belong to the Church is not for self-improvement, but in response to our love of Jesus Christ, a love he expresses perfectly at Easter, and it’s about our desire to have him at the centre of our life. The closest parallel would be like the soccer player who wants to represent their country. They are inspired by some great role model who has helped their country win the Soccer World Cup. They now orientate their life to achieve the same goal. But Baptism takes things a step further. Jesus did not come simply to be a role model, or to invite us on a journey of self-improvement. Of course, we can benefit from such things. But there are many role models and many ways to improve oneself. However, there is only one God, and this God through Easter offers a message that God loves us so very much and desires that we share God’s life to the full. It is like turning up to the soccer stadium to watch your hero, then Jesus turning to gaze upon you, walking up to your seat, and taking you by the hand to draw you onto the playing field. Through our Baptism, we are no longer spectators but players, no longer seeking role models but offering a witness to others, no longer about self-improvement but seeking the betterment of our world. Maybe it’s time to get training. The Good News is that we are on the winning team. A Year of Grace is the Australian bishops' gift to the Church to celebrate and renew our faith and life as Catholics. 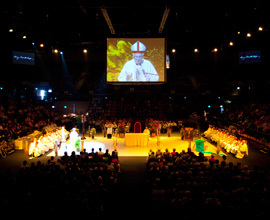 It will begin at Pentecost 2012 and is an exhortation from the bishops of Australia to "Start afresh from Christ. The Year of Grace has been like a seed, being watered gently and growing with tender care. It comes from the bishops' reflection over a number of years on the Apostolic letter Novo Millennio Ineunte (at the start of the new millennium). A Year of Grace website, www.yearofgrace.catholic.org.au has been created. It is a space of prayer; a place to seek resources and a place of information for you as we go on this journey together in the Catholic Church in Australia. What is the Year of Grace? The Year of Faith calls us into a deep renewal of our faith through retracing the history of our faith, studying the Catechism, praying the Creed and seeking to be an active witness of what we believe. These two impulses of the Holy Spirit complement each other and provide opportunities for us to discover and nurture the gifts of ‘grace’ and ‘faith’ at work in our lives. Our Diocesan Pastoral Plan, Bearers of Christ’s Love, called for the re-establishment of the Diocesan Pastoral Council. What is the role of such a Council, and how will it be established? The Diocesan Pastoral Council will consider the pastoral questions of our day and make appropriate recommendations to the Bishop. The Diocesan Pastoral Council acts as a significant form of collaborative dialogue and discernment in service of the pastoral needs of the Diocese. Study matters that concern the pastoral activities of the Diocese, particularly with concern to parishes, and make recommendations to the Bishop. Collaborate with other Bodies in the implementation of the strategic pastoral goals of the Diocese. Collaborate with other Bodies in an annual review of the strategic pastoral goals of the Diocese and recommend any necessary revisions to the Bishop. Note: The “strategic pastoral goals” currently align themselves to the Diocesan Pastoral Plan. How will the Council be Established? 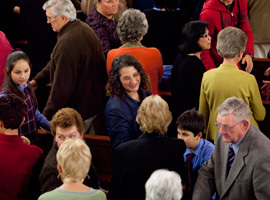 After Easter, members of the Diocese will be asked to nominate themselves to join the Council. These nominations will include a questionnaire offering a reflective process to detail the gifts and experience that the nominee would bring to the Council. Interested applicants will need to be endorsed by the priest in their parish of worship. Then, at the beginning of May, Bishop Peter will appoint the final Council from nominations received. If you are interested in joining the Diocesan Pastoral Council or know someone with the qualities to offer a rich contribution, please consider finding out more. You can contact us to gain the necessary forms which will detail the commitment involved and the qualities being sought. Cereal (various types), skim milk and multivitamins. The rest of the day’s meals tend to be a lot more interesting and a lot less rushed! What are three significant moments in your life journey? What drew you to becoming a Catholic? The love, support, faith, and hope that being part of a Catholic community provides. I was very fortunate to be a part of St Patrick’s College, Campbelltown, when I was diagnosed with lymphoma. It was here that I was blessed to work with people who truly embodied what it is to be a Catholic Christian. I feel that I have so much to be grateful for during this time as my faith was nourished and my body was able to heal in a supportive and caring environment. I could have picked all of the usual (and very worthy) subjects for this question, but I think that there are a great many people who we encounter in our everyday lives that perform ‘heroic acts’. People who have made a great impression on me in terms of their heroism are those that I have seen who live a life of service in order to help other people. People who wake up and spend their day trying to make someone else’s life better or healthier, or more comfortable, or maybe those who just try and lift one’s morale with their generosity and kindness of spirit. I have always had a fascination with Ancient Egypt. Borne out of spell-binding 3 Unit Ancient History lessons with a motivated and inspirational teacher, I would love to finally visit what truly was a fascinating, mysterious and sophisticated civilisation. What initiation experience has stayed with you since initiation last Easter? On overwhelming feeling that I was ‘coming home’. What inspires you in your ministry within or as part of the Church? I have a desire to allow our children (and those that I know and teach) to have a life guided by the Gospel as I believe this to be a most precious gift. As an educator I look at the challenges of young people these days and believe that for many, a little more faith may lead to a great deal less struggle and hardship endured. I believe that we need to be more accepting and less judgmental of others. We need to try and not be quick to dismiss others with prejudice and stereotypes. With a little more love, kindness and understanding there would be a lot less conflict in our relationships, communities and the world as a whole. Do you look forward to experiencing the Easter Triduum? For me it is the greatest of the Church’s liturgical celebrations. The words, symbols, rituals and actions speak volumes about life, death, conversion and the deep love that God has for each of us. The aim of the book, Called, Gifted and Sent by Rev Dr Elio Capra sdb, is to re-capture the sense of wonder and awe found in these celebrations. 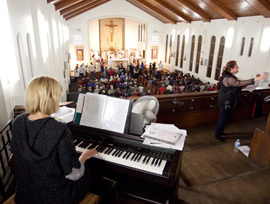 It especially follows the journey of catechumens as they prepare for the sacraments of initiation at the Easter Vigil. The book takes the reader on a journey from Holy Thursday to Good Friday and concludes with the Easter Vigil. The prayers, symbols and rituals of the Three Days are explained and explored with special emphasis placed on the celebration of the sacraments of the Easter Vigil. The author uses the prayers, symbols and rituals to explain how, through them the followers of Christ are invited to experience in a sacramental way the action of God. The symbols, words and rituals are the starting point leading Christians to see that God, the Father, the Son and the Holy Spirit, is still doing wonderful and mighty deeds on behalf of those who celebrate them. The book aims to help readers see that the celebration of the sacraments provides meaningful benefit to the way they live their lives. Through the sacraments we are given the grace and strength to go out and to live as people who have been called, gifted and sent by God as signs and bearers of God's love. Feelings, emotions and experiences that are part of being involved in the words actions and rituals of the liturgical celebrations. Reflecting on what God is doing for us through these words actions and rituals. What these words, actions and rituals call us to be and witness. Reflection questions are provided for either personal or group reflection and a journal accompanies the main book as a way of recording these reflections. This book is an excellent resource for discussion groups, prayer groups and RCIA teams, especially during the post-Easter period where new Catholics are drawn to reflect more deeply on the Easter sacraments. Capra, Elio. “Called, Gifted, Sent: The Sacraments of Christian Initiation and the Triduum”. ISBN: 9781921154119. Melbourne, Vic: James Goold House, 2010. Stop now, and pray for someone who you would love to come to a Holy Week liturgy. Ask God’s wisdom for the best way you can take to engage with them. Overcoming Objections: People sometimes speak about church scandals, hypocrisy or their busy lives as excuses for not coming to Holy Week liturgies. Rather than becoming defensive, acknowledge their frustrations. Suggest that despite all this, there is still something special about spending time with God and others to say thank you to Jesus. Learn more about what your parish and Diocese offers. This way, you may be able to encourage those you invite to also participate in a local playgroup or connect them with a support service offered by CatholicCare, and so on. Greeters: Your church may not have greeters. Either way, you may wish to ask your parish priest about whether you can welcome others at Easter. It adds a special touch. A smile, hello and handing out of a bulletin and Mass card can make all the difference. Take your seat just before the liturgy begins. This way you can be available in the foyer. Visitors may need to find a toilet or may appreciate a hand with a stroller. You may also be able to sit nearby and offer assistance. Say hello to someone new: After each Holy Week service, try and find someone you don’t know, especially someone looking isolated, and make a point to say hello. A simple “Happy Easter” works. Introduce them to someone else. Expressing Gratitude. If you connected with someone at Easter, especially if they came at your invitation, affirm them and thank them for their participation. Follow Up: If someone came at Easter, consider following up with a chat soon after. Invite them to come with you next time you go to Mass.